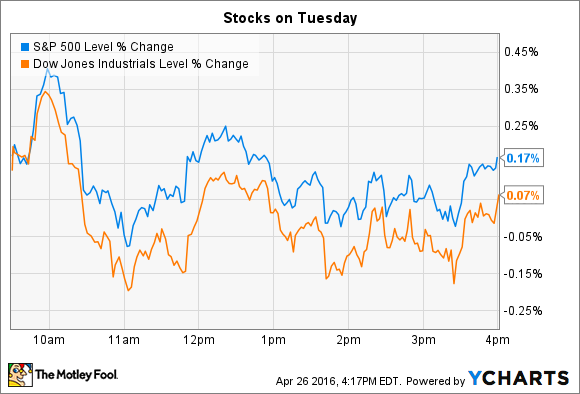 Why these two stocks broke away from a broader market that was flat on Tuesday. Editor's Note: This article originally stated that the Container Store Group was engaging in layoffs and eliminating 401K retirement account matching entirely. No employees have been laid off and, while 401K matching is being frozen as an employee benefit, it is not being eliminated. In economic news, consumer confidence ticked down in April, according to the latest report by the Conference Board. Consumers' rating of their current situation improved, but their projections of both future business conditions and the future availability of jobs declined, dragging the overall confidence rating lower. Meanwhile, individual stocks making notable moves today included Procter & Gamble (NYSE:PG) and The Container Store (NYSE:TCS). Procter & Gamble was the Dow's worst performer after the consumer goods titan revealed a slowdown in fiscal Q3 organic sales growth. Three months ago, the company posted its first improvement on that metric in almost two years, but that positive momentum reversed itself as sales inched up by just 1%, compared to 2% in Q2. Additionally, all of that organic growth came from price hikes rather than increasing sales volume: Volumes declined across most of P&G's product categories. The grooming business fared the worst while theTide-anchored fabric care division was the best performer. P&G's total 1% organic growth trailed rivals Unilever and Kimberly-Clark, which this week posted sales gains of 5% and 2%, respectively. The good news for shareholders is that P&G reiterated its full-year sales target (at about the same 1% pace as in fiscal 2015) and continues to make impressive progress toward cutting costs and raising cash by selling underperforming brands. The company's strong cash flow also easily funded increasing investments in the business and cash returns to shareholders. Still, weak top-line growth suggests it could be some time before P&G gets back to steady, market-beating sales gains. Container Store spiked 20% higher today to claw back a small piece of the losses investors have endured with the stock this year. The catalyst for the jump was fiscal fourth-quarter earnings results that included encouraging news on comparable-store sales, which came in flat and beat management's guidance for as much as a 5% decline. Gross margin also held steady at 58% of sales, confirming that the home-organization products retailer didn't have to slash prices to get higher store traffic. Image source: The Container Store. "We performed much better than we projected for the fourth quarter and importantly, saw improved and positive comparable-store sales across non-TCS Closets and non-elfa areas of the store," CEO Kip Tindell said in a press release. Wall Street also cheered TCS's aggressive cost-cut plan that calls for slower store expansion, a company-wide salary and wage freeze, as well as a freeze on 401K matching for the time being. While those initiatives should help 2016 profits jump to as much as three times the $0.11 per share The Container Store earned last year, Tindell and his team will have to balance expense-slicing goals against protecting a corporate culture that has earned it a listing as one of Fortune magazine's "Best Companies to Work For" for 17 consecutive years.